There comes a moment in every bride-to-be's life when she says to herself, "Oh, crap." And not because she's freaked out about getting married, but because her wedding is in three months and that's about the time when "Oh, crap" becomes a regular phrase in her daily routine. Needless to say, we've been busy around these parts lately, but thankfully, I've been checking a whole lot of "Oh craps" off my list and it feels pretty good. We registered. We ordered invitations. We met with the florist. 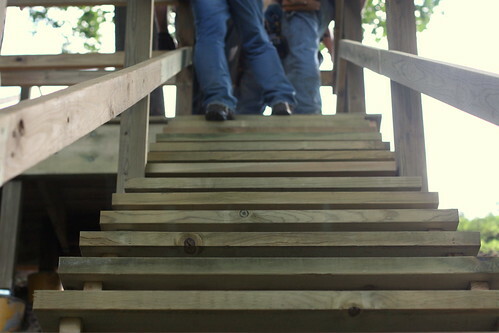 We built stairs. We tasted PIE. 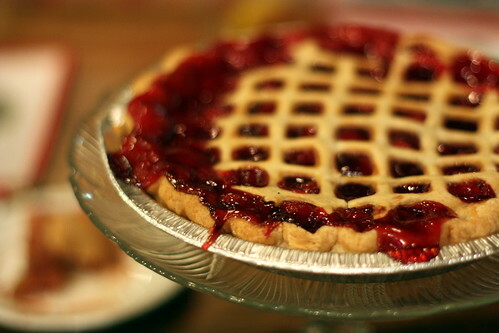 Say it with me now: PIE. PAHHH. As in, weddin' PAHHH. That's the great thing about having a wedding at a lake house in Michigan, in a big tent in the backyard, in September. 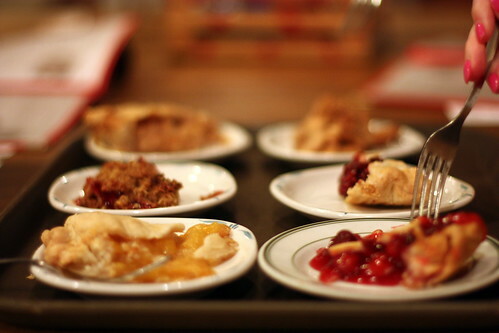 Pie just feels so right. 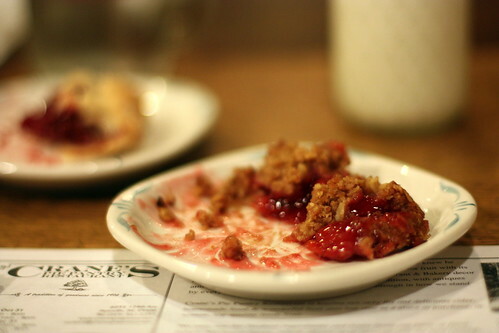 We went to a place called Crane's Pie Pantry in Fennville, Michigan. 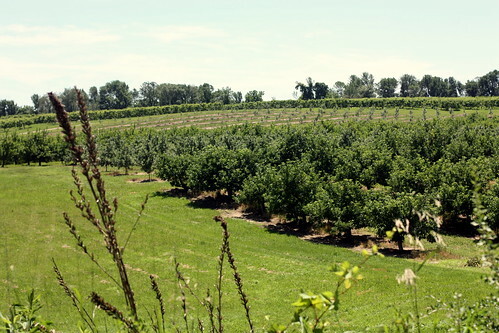 The bakery and restaurant also had an orchard, with rows and rows of fruit to be picked and baked and loved. Next door, there was a house with a row of overalls hanging on a clothesline. 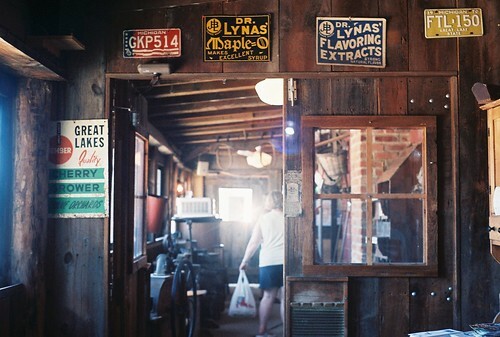 Inside the restaurant, ads from the '50s hung on the wall and an old school bench stood in the corner. 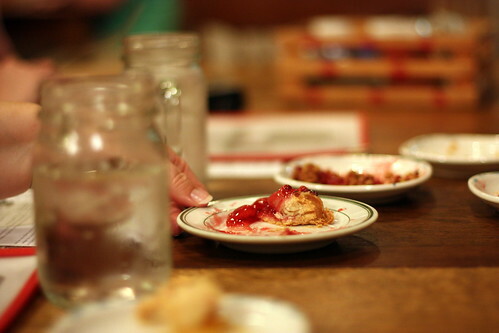 Laura Crane brought us pie slices on a tray, served with glass mugs filled with milk. And the pie. People, the PAHHH. The only thing better than a warm slice of gooey, cozy pie is 10 of them, in every flavor, circling the table as you hold a fork firmly in hand and declare that they're all good. I want them all. There was apple, of course, and cherry, rhubarb, strawberry-rhubarb, blueberry, blueberry strudel, apple crisp, peach, and cherry crisp. Good thing it takes about 30 pies to feed 200 wedding guests, because I might just get what I want. All of them. I may also need an apron to wear over my wedding dress, because I'm not sure I'll be able to stay away from the blueberries. Add wedding apron to the list. Oh, crap. We're getting there, though. Definitely getting there. Oooh, I LOVE Crane's! I lived in Holland until 6 years ago and did my student teaching in Fennville, so I know it well. They have ah-mazing pie. Nice choice! PS - the stairs look awesome. seriously. 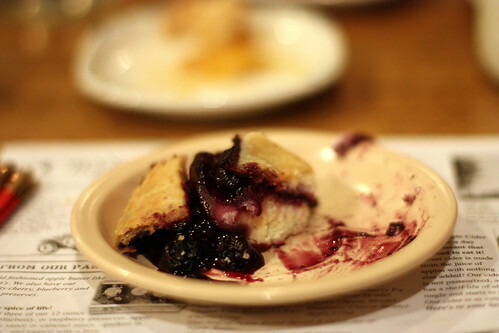 maddie - yes, wedding planning can get hectic, so i'm always glad when it's time to eat pie! nicole - that's crazy! their pie is amazing. i can't wait for more. I know what you mean! My wedding is in less than 3 months and I am having oh crap! moments daily. We are having pie too :) If my fiance had his way, he'd make pumpkin pie for everyone but I think we'll have more of a variety. I am really looking forward to that part of the wedding. lindsay - yay for wedding pie, and thanks for dropping by! where/when are you getting married? "wedding apron. oh crap",, I love it :) So glad youre getting what you want, sounds incredible!